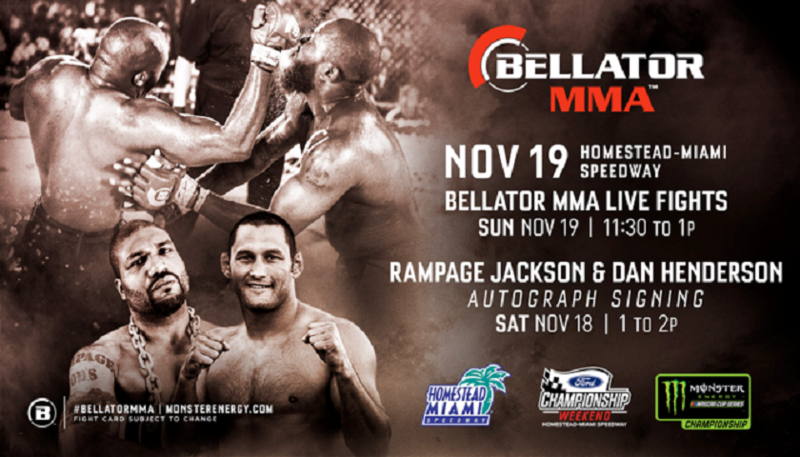 LOS ANGELES – The Monster Energy Bellator MMA Fight Series closes its 2017 season with a fourth and final stop at Homestead-Miami Speedway in Homestead, Fla. on Sunday, Nov. 19. Set to take place during Ford Championship Weekend, fighters will take to the cage Sunday morning ahead of the final race of the 2017 Monster Energy NASCAR Cup Series Playoffs that will determine the next Monster Energy NASCAR Cup Series Champion. Just hours prior to the start of the Monster Energy NASCAR Cup Series Ford EcoBoost 400 on Sunday, Nov. 19, the Monster Energy Bellator MMA Fight Series will feature MMA action throughout the morning beginning at 11:30 a.m. ET at the Monster Energy Fan Zone at Homestead-Miami Speedway in the display area on the north side of the track. Admission to the event is free and open to fans. Additionally, on Saturday, Nov. 18 from 1-2 p.m. ET, fans will have the opportunity to meet former world champ and Monster Energy athlete Quinton “Rampage” Jackson, as well as former PRIDE and STRIKEFORCE titleholder Dan “Hendo” Henderson, at the Monster Energy Fan Zone at Homestead-Miami Speedway in the display area on the north side of the track. Admission to the event is free and open to fans. Through Bellator MMA, alongside longstanding partner Monster Energy, mixed martial arts will be included as a pre-race activation exclusively for fans in attendance. The lineup on Sunday will consist of four MMA bouts featuring some of the best regional up-and-coming talent, with the main event prospects in consideration to be signed to a multi-fight Bellator MMA contract. The Monster Energy NASCAR Cup Series Ford EcoBoost 400 at Homestead-Miami Speedway takes place Sunday, November 19 at 2:30 p.m. ET. Tickets to the race are available at www.Homestead-MiamiSpeedway.com or by calling 305-230-5255.